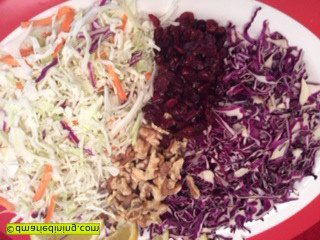 Coleslaw is a dish that mostly has a crunchy texture. Between the carrots and the cabbage you have a nice bit of popping going on after taking a bite. I added walnuts to the recipe to give it another layer of crunch but on the softer side. 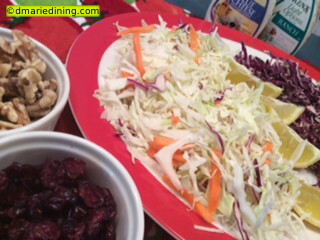 Throwing in some cranberries helps to give the coleslaw a certain level of sweetness and brightens up the taste buds. 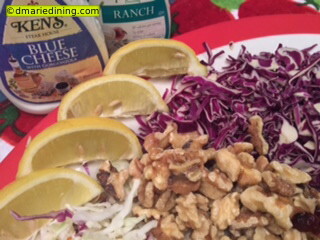 This version of coleslaw paired nicely with the orange BBQ chicken wings I made for Father’s Day. It was so good my mom told me she really liked it even though she rarely eats coleslaw unless she makes it herself. Once you get mom’s seal of approval on a dish you know it’s good. In a large bowl combine all ingredients and toss gently until well mixed. Chill for at least 30 minutes prior to serving. To cut down on prep time use a bag of shredded cabbage with carrots.